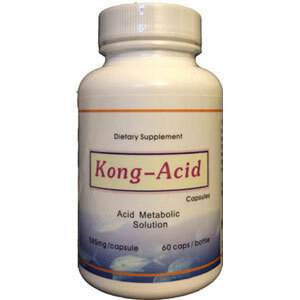 Kong Acid is composed of essence of ocean species and all natural plant. It helps balance the body acidity, reduce the levels or uric acid, relive discomfort and pain caused by high acid in the body. Kong Acid is composed of essence of ocean species and all natural plant. It helps balance the body acidity, reduce the levels or uric acid, relive discomfort and pain caused by high acid in the body. This product is 100% natural, contains no chemical additives, heavy metals or stimulants. Reduce the levels or uric acid and relieve pain and discomfort from gout. High acidity in the body, high uric acid, gout, pain in joints, lack of energy, fatigue. For adults only, take 2 capsules before breakfast and 2 capsules before dinner.